When you add chlorine bleach to a colored shirt, the chlorine molecules attack the dyes by breaking up the compounds. Hydrogen peroxide bleaches blondes, and sunlight can fade the color from a beach towel. But when you think bleach — and imagine its familiar smell — you’re probably thinking about Cl. A colored dye is a compound — a long string of different chemicals put together. The new smaller compounds are colorless — and that’s how bleach makes things white. It’s also why, if you keep bleaching something, it’ll eventually get holes in it. This same method of attack is also what makes chlorine bleach such a powerful disinfectant. It breaks apart the cells of bacteria, mold or mildew — and kills them. It is widely used to purify water. In the fall of 2001, chlorine dioxide gas was sprayed in U.S. Senate offices to kill anthrax spores. It can even kill people, if it’s strong enough – the liquid burns the skin and chlorine gas destroys cells that line the lungs. Was also an early chemical weapon — used as poison gas in World War I. It can combine with nearly any element. It’s most commonly found in sodium chloride – ocean salt. The chlorine bleaches which we use around the house are compounds – for example, Chlorox is a 5% solution of sodium hypochlorite, NaClO. It is very dangerous to mix a chlorine bleach and an ammonia bleach when cleaning, NH2Cl is produced which is toxic! Sunlight can also bleach color out of substances. Sunlight has a wide variety of frequencies (energies). Some the light is in the ultraviolet region of the electromagnetic spectrum. Light of this frequency can break apart compounds in a manner similar to that of the bleach. The active ingredient in bleach is sodium hypochlorite (NaOCl). 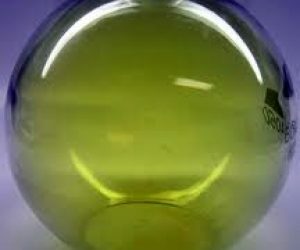 Most liquid bleaches are a 5.25 percent solution of NaOCl. 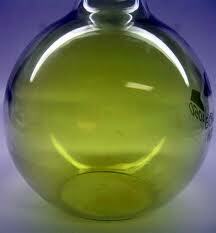 From the Greek word clwroV (chloros) means “green” or “yellowish pale”. Although free chlorine does not occur in nature, its compounds are common minerals, and it is the 21th most abundant element in the earth’s crust.